strengthMuscle strength and power that takes place in Rapelling, that is, helps you develop both brute force compared with other physical activities or sports. 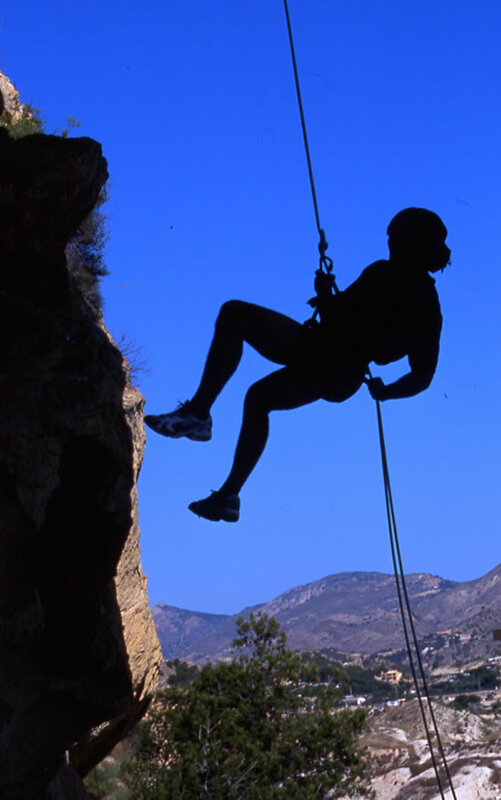 EnduranceCardiovascular endurance constantly providing Rapelling practice, that is, how much help you cope ejercitándote long compared to other sports or physical activities. 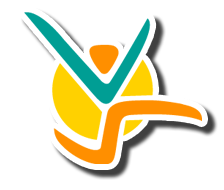 AgilityAbility to move the body as desired quickly and accurately obtained by practicing Rapelling, constantly compared to other physical activities or sports. ReflexesAutomatic responsiveness to stimuli is achieved spontaneous Rapelling, practice compared to other sport or physical activity. AccuracyHow much will dominate specific body movements to achieve the same result to practice Rapelling, compared to other sports or physical activities. BalanceBoth are able to control the body's muscles to prevent the imbalance by making Rapelling unlike other sports or physical activities. ConcentrationThe ability to focus mind and senses intention to achieve a specific goal that is acquired by practicing Rapelling, compared to other sports or physical activities. ToningStylization of the body and muscle derarrollo pruduct of optimal levels of body fat that comes from Rapelling, compared to other sports. Calorie BurningThat many calories are burned while practicing Rapelling, when compared to other sports or physical activities. 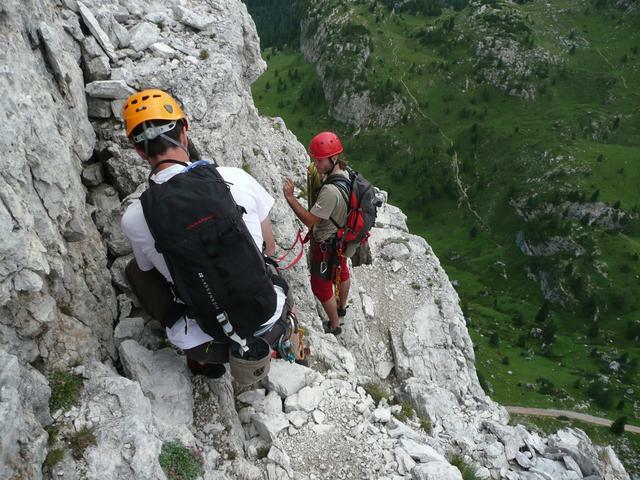 Rope descent system used on vertical surfaces, is used in places where the fall is otherwise difficult, to make a descent only requires-in addition to knowing the proper technique-carry (on) minimum team and a rope. 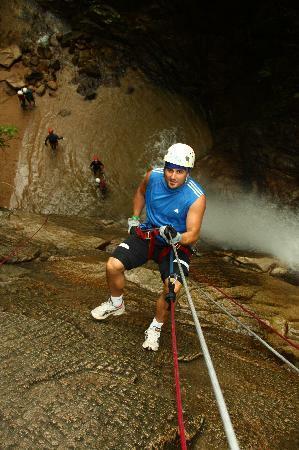 The rappel is used in hiking, mountaineering, rock climbing, caving, canyoning and other activities that involve running vertical drops. The rappel is also used in rescue, both natural environments and in urban as well as in military operations. The Austrian Kart Dulfer was the one who modifies passing the rope between your legs being able to go down a longer distance and have more security. 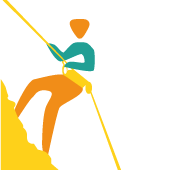 In the 80's, and having gone through phases in which Red Cross used in for rescues or in the military, the rappel becomes a practice of adventure tourism considered an extreme activity. Follow the directions of your instructor and take precautionary measures prompted. It is of little practical vertical walls, is down by placing the rope over the shoulder to pass around the outstretched arms, controlling speed with the hand grip and friction between the shoulders and arms. It is considered the simplest all-purpose as it requires no special equipment, the climber is placed against the anchor, put the rope between the two legs, passes around the hips so that it crosses the chest to the opposite shoulder, passes the string through the shoulder and dropped the back, holding the hand of braking is the same side as the hip pink rope. The other hand stops the string above the climber to keep upright. The risk of this system is the friction of the rope with the body so that the skin should be protected as the friction can cause burns. Apply the hair up, if you have long hair. 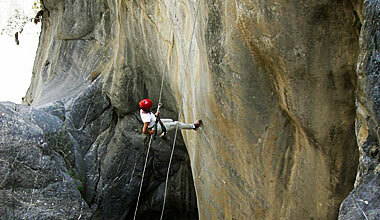 Dulfer is similar to the difference that the rope does not pass directly through the thigh, but by a carabiner harness and rope passes through the back.